One of the more interesting Clubcard Boost redemptions is for UK Hilton Hotels. You can see details on this page of the Clubcard website. These are all good changes. There is, however, one downside – Tesco has taken away the instructions on how to check availability online. They want you to ring the call centre, which is time consuming and – if you have a variety of hotels and dates to choose from – slow. Looking at reports on the Clubcard site, you will also receive a hard sell to book a room for cash if no redemptions are available. The Tesco / Hilton website page has all of the information. You are restricted to UK hotels across all Hilton brands. You receive 300% of the face value of your vouchers. Note that the price charged is the cancellable bed and breakfast rate. However, the booking you make will not be cancellable. This means that you are not getting a true 3 x face value redemption with Hilton because you should be comparing it with the price of a non-cancellable bed and breakfast rate. Bookings must be made 14 days in advance. You search here at hilton.com for availability using Promotional Code PR20TC. You need to click ‘Advanced Search’ on the home page in order to bring up the box where the code goes. At this hotel, it is actually a ‘genuine’ 3x face value redemption as the non-cancellable rate is very close to the Tesco price. Once you have checked availability, you can ring Hilton to make the booking using the instructions given on the Clubcard website. This is a far easier way of searching and booking than using the telephone, especially for cities like London where there are multiple hotels to choose from. You WILL get points, as it happens, because it goes through as a cash booking. You also get all of your Hilton HHonors benefits because you are booking direct. I could always snag a different brand for a lower price and save my vouchers for the next double up. 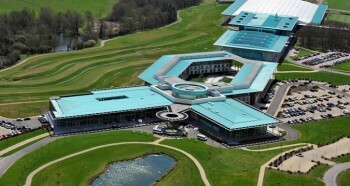 You’d be paying £17 at St George’s Park because there isn’t much else nearby! These vouchers are a terrible deal. There are lots of stories of Hilton trying to get you to pay more. I couldn’t get the room or hotel I wanted. This was in Birmingham where there are 3 hotels. Then I tried Bristol on a Friday night and I could not get the hotel I wanted unless I paid for 2 nights! i.e. one night vouchers, one night cash. I settled for a less pleasant Hilton and calculated that I saved just £11 by using £75 of ‘free’ Hilton vouchers! I would have got the hotel I wanted if I had paid the extra £11 and not used Tesco vouchers (£25 cash value of the vouchers plus £35 extra for a ‘flexible rate’ plus £7 postage costs =£67. Prepaid cash rate at £78). Avoid this deal – I have lost all faith in Hilton and will switch away from Hilton Honors once I spend my points……..
I’ve seen the reports of the ‘hard sell’ on the phone – that’s why I wrote this piece, so you can just tell them the nights you want and you will know they have them.